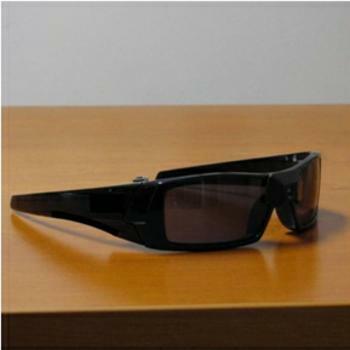 Dynamic Eye’s first product will be glare shielding sunglasses, which act like polarized sunglasses all the time, and get extra dark just where glaring light sources appear. They do it by using a liquid crystal display in the lens of the sunglasses. Virtually all liquid crystal displays use two polarizers: one where the light goes in, and one where the light goes out. In our glasses, the polarizer on the front will absorbs one polarization and lets the other one through, so about half the light gets through. The liquid crystal in the middle determines whether the light will get through the second polarizer. When a pixel is turned off, light gets through, but when a pixel is turned on, the light gets absorbed by the second polarizer. Even the best LCD lets a little light through, so you can still see things through the darkened pixels, such as the painted lane markers on glaring wet pavement.